In-Memory OLTP, code named Hakaton is a separate database engine introduced in SQL Server 2014 and it is combined with SQL Server traditional database engine. So when you install SQL Server, you will get both database engines. Modern computers/servers are getting more physical memory (RAM). Windows Server 2016 support 24 TB of physical memory. So it is clear the future is more towards In-Memory databases regardless of database type. In-Memory OLTP simply means you can create memory optimized tables as well as natively compiled stored procedure. In other words, you can store the schema of the entire table and data in memory. However, it obviously has some limitations too. Those limitations will be addressed in every new release of SQL Server. It is possible to migrate the tables and other objects in existing databases to memory-optimized structures. Since it has limitations, the first step would be to identify the list of objects which are eligible for the migration. 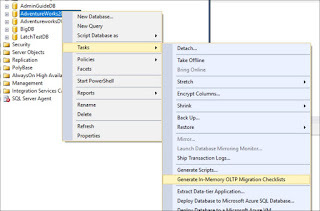 The SSMS (SQL Server Management Studio) provides a feature (wizard) that you can use for this purpose. The below steps will go through the details of the wizard against the sample database, AdventureworksDW2016CTP3 which you can download and install. Follow the below steps to generate the checklist. 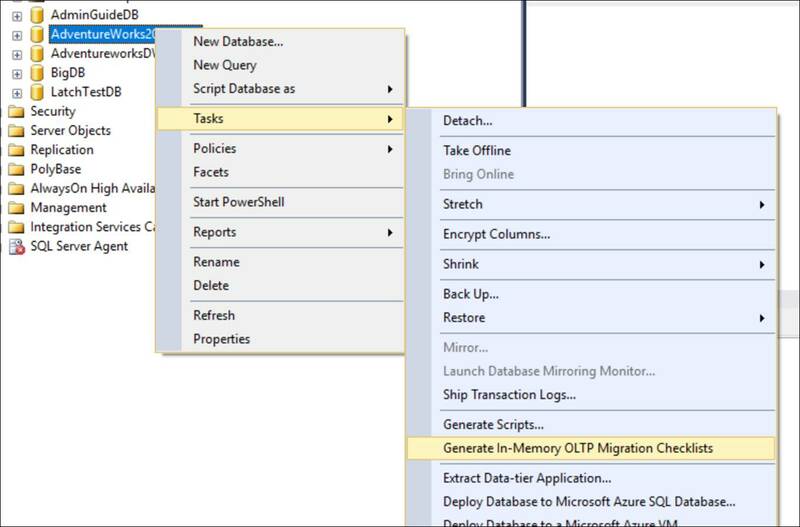 Connect to the server in SSMS. Click Next on the first page of the wizard. In Summary page, you can generate the PowerShell script for this task. This is optional. Click on Finish. It takes some time depending on the number of objects (tables, triggers, foreign keys, indexes, stored procedures, etc) in the database. Because it checks all the dependent objects against the In-Memory OLTP rules. You can view the checklist generated by the Advisor in the location you specified in step #4. It creates the subfolders under database name folder for each object. See below screenshot. The contents of each folder look like below. Below screenshot displays the checklist for stored procedures. Open each HTML file to see the details of the analysis. I will write another blog post on how to analyze the checklist information.